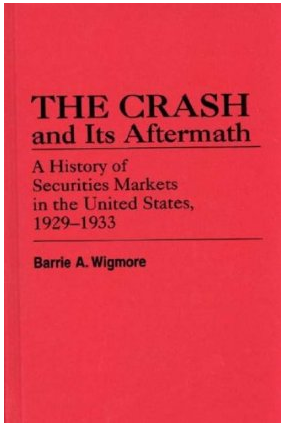 In 1985, one of the greatest scholarly works ever penned on the Great Depression was published by Barrie A. Wigmore under the title The Crash and Its Aftermath: A History of Securities Markets in the United States, 1929-1933. Using actual data from the period that took years to acquire, analyze, and interpret, Wigmore takes 751 pages to walk you through the story of the worst economic meltdown in 600 years, told almost entirely in numbers. … examines the various bond markets and relates the money market to the bond market, monetary policy, business conditions, and the problems of the banking system. Treating each year from 1929 to 1933 separately, Wigmore shows the interrelation between the stock, bond, and money markets and events in politics, the economy, international trade and finance, and monetary policy. The Statistical Appendix of 41 tables consolidates financial statistics which have hitherto been widely dispersed, permitting in-depth study. He actually breaks down the market value of individual areas of the economy and analyzes how they were hurt by the meltdown. 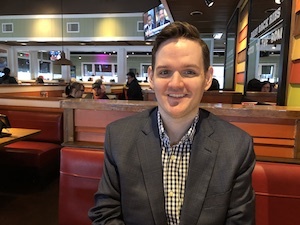 He looks at the total amount of capital invested by month and year into various types of securities and assets (e.g., Industrial, Lands, Buildings, etc., Public Utilities, Railroads). It is a veritable gold mine of information, data, statistics. For example, take a look at one of the random tables. 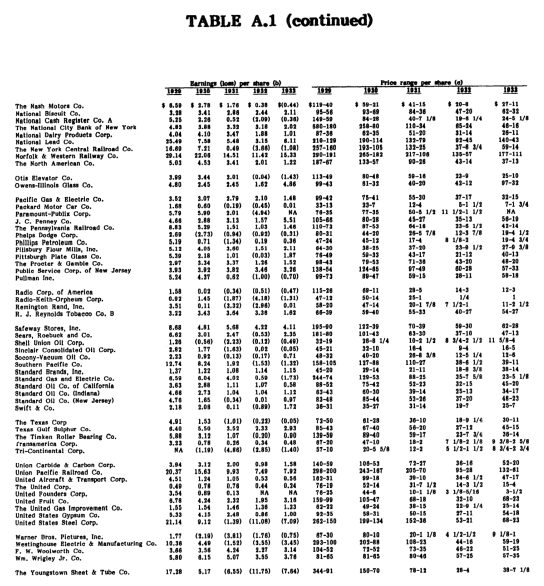 This breaks down the most important companies in the United States at the time and shows you the earnings per share for the business by each year throughout the depression, and the range in stock prices for the same year. Many of the names on the list might sound familiar, and it is because you know the company even if you don’t realize you know the company. National Biscuit Co., for example, looks like it just disappeared. It didn’t. You might not have any stock certificates with that name on it, anymore, but you got very rich if you owned it. It’s now called Nabisco (National Biscuit Company), and was acquired by R.J. Reynolds, the tobacco giant, in 1985. Then, in 1993, Kraft bought Nabisco’s cereal business before selling it to Post Cereals, while in 2000, Philip Morris acquired the rest of Nabisco. It merged it with Kraft Foods then spun it off to shareholders before splitting itself into two firms, Altria (domestic tobacco) and Philip Morris International (foreign tobacco). Recently, Kraft split itself into two companies, Mondelez International and Kraft Food Group. The old National Biscuit Company is around, but it’s assets are now split among half a dozen firms, all of which have pumped very large amounts of cash into the pockets of owners. [mainbodyad]The same goes for half of the oil companies mentioned in The Crash and Its Aftermath, which are now consolidated into Royal Dutch Shell, Exxon Mobil, ConocoPhillips, Chevron, and a handful of other giants. In fact, even with the handful of disasters (the United Fruit Company involved a military coup, executive suicide by jumping out of tall buildings, a hostile takeover, and bankruptcy court), someone who bought shares in all of these companies throughout the depression would have seen his or her heirs get very, very rich over the subsequent 80 years. You’d own shares in far more companies as spin-offs, mergers, split-offs, and other transactions rearranged the entities in which your productive assets were held, but things worked out very well. If you are interested in financial history, and how bad things have gotten in the past, you should pick up a copy of the book. The cheapest source I’ve found is the used book listings at Amazon, where you can get a copy for as low as $150 if you are lucky. It is such a valuable scholarly source of data, I think it’s a fantastic value. If it gives you a better perspective during the next market crash, and saves you from even one mistake, it should pay for itself many, many times over from that single decision.